EZ Boardwalk sawmills are manual band mills built by Edward Zimmerman, his family, and a neighbor in northeast Missouri. The engine provides all of its power to the band saw. 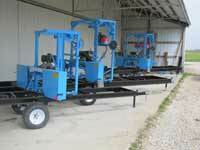 EZ Boardwalk offers two sawmill models listed below with varying features and options. EZ Boardwalk sawmills can be fitted with additional features such as trailer packages, longer beds for sawing longer logs, shingle and siding jigs and more! The Timberwolf 1 ¼” x .045 thick blade has become our most successful blade to date, running on small to medium size band mills and resaws. This blade for its size is more stable and will cut faster than any other blade on the market. EZ BOARDWALK is an authorized dealer for Timberwolf bandsaw sawmill blades. Keep a supply of fresh blades on hand to keep your cuts straight and smooth! EZ Boardwalk is a dealer for LogRite Tool's canthooks, peaveys, hookaroons as well as LogRite log arches. We also build an EZ Boardwalk Log Arch and sell the "Log Wizard" chainsaw attachment.